To love and teach movement because it is human and beautiful, full of its own meanings and its own absurdity, has been denied to us. We have had to struggle up-hill, like Sisyphus, to make movement something that it cannot be. Thus movement seems sometimes to fail us, not because of what it is, but because of what we have asked it to become. These are not separate and isolated learning domains within Physical Education, but are interconnected and interact on each other. For example if children learn how to support each other in a kind, friendly but challenging way then then more will be more willing to ‘have a go’. This I believe in is key for developing movement competency. It requires a balanced approach, guided through observation and dialogue, as to which is the most important to develop at that time. However without helping children find meaning in movement is the learning that they receive in the four different domains enough to change habits and develop a lifelong love affair with movement? I keep asking but have yet to find an answer. Inferior skills, poor movement habits, only bits of fitness knowledge or distilled information about movement science, scant introductions to movement subcultures—all of these features of subsidiaries that too often typify the prudential, intellectual, and affective approaches leave children . . . unable to explore, unable to act creatively . . . uncommitted, and unmoved. . . . They exercise out of obligation, learn some movement theory, appreciate the mechanisms of health, have a bit of fun, and then in too many cases, return quickly to what they were doing before. He suggests that far deeper levels of meaning beyond the three typical focuses of our PE classes await the children we teach. Levels of meaning that may help us achieve that prized but elusive goal of empowering a child to an active and healthy lifestyle beyond school. Andrew Hawkins goes further and states ‘to define [physical education] in pragmatic, utilitarian, materialistic terms (i.e., in terms of the subsidiaries of health and wellness) is to propose a purpose that is somewhat less than fully human; thus, the loss of our professional soul. Such an approach might have short-term benefits in money, prestige, and influence but at the cost of a genuine humanizing purpose.‘ That is all well and good to believe this on a philosophical level, but as a teacher or coach what does it actually mean with regards to our practice? How can we practically provide meaningful experiences within PE and Youth Sport? Kretchmar warns ‘Perhaps it is too much to ask any of us to be concerned not only with teaching movement to our students . . . but also laying a groundwork for their being moved.‘ With regards to my experiences of teaching PE and the many pragmatic, utilitarian and materialistic outcomes we are now expected to deliver, he may be very well right. However I think we owe it to the children we teach, where we can, to keep asking questions both to ourselves and to them about a deeper and more genuine meaning of movement. 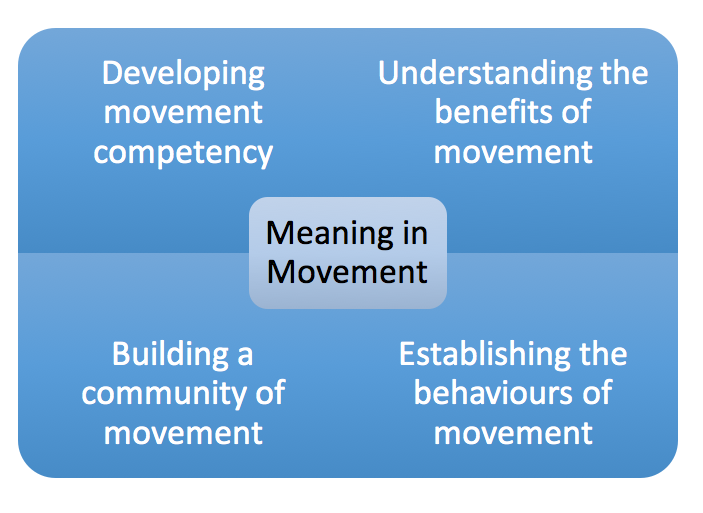 For more information on Kretchmar’s framework for meaningful experiences in PE I can highly recommend checking out the work of Déirdre Ní Chróinín, Tim Fletcher and Mary O’Sullivan at Learning About Meaningful Physical Education and on Twitter @meaningfulPE.